Bill Irwin has extensive experience in the construction, real estate and automotive industries. 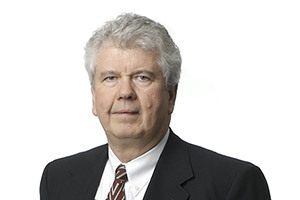 He also has significant experience working with organizations in the not-for-profit and health services sectors and understands the unique challenges faced by these organizations and their Boards. He is able to help share advice that he knows has been helpful to others in the sector. Bill became a Partner in 1979. Although retired, Bill is available and provides assistance when needed. "Just because you can do it, does not mean you should." Treasurer for the Bells Corners Union Cemetery Board; part of the Finance Committee of the SCH Health Services Foundation; formerly served as Treasurer for the Pinecrest Little League and The Multiple Sclerosis Society of Canada. He has served for 5 years as a Route Coordinator for the Tour de Quickie (now the CN Cycle). Reading, current events, being at cottage, boating and all types of outdoor activities such as hiking, skating, bicycling, etc. Business: Witnessing and hopefully helping the evolution of Welch LLP from 1970 to the level of professionalism it has attained to the beginning of 2017. Working with many talented and committed people including clients along the way. Personal: Seeing our family grow and mature into fully contributing members of society.